Spearheaded the “Gamers are dead” media blitz with an often-quoted inflammatory piece. Wrote at least three times about Merrit Kopas, without disclosing their friendship. Between 2009 and 2015, wrote eight articles about minor developer Ian Bogost, namedropping him at least nine more times, without disclosing their work together at Gamasutra. Their personal friendship — which is corroborated by frequent Twitter conversations and was admitted by Alexander to have started in 2007 — was disclosed only in one of the articles. 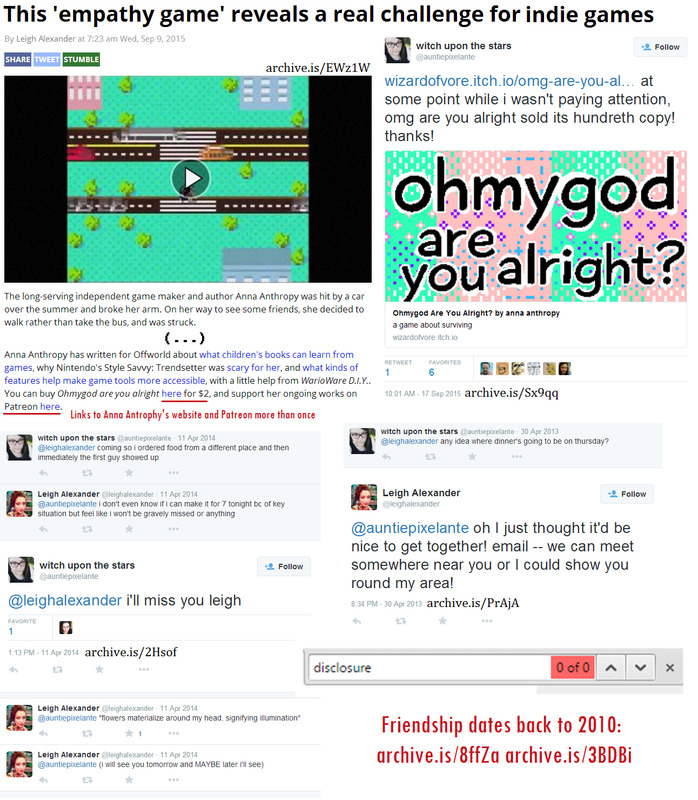 Wrote about Anna Anthrophy, also an occasional contributor to her site Offworld, at least in seven total articles, 2010 to 2015, without disclosing their friendship, shown both from their Twitter conversations and indirect means. Wrote about Robin Arnott without disclosing their friendship. Wrote about Naomi Clark on three occasions, without disclosing their friendship. Wrote two times about Gone Home, without disclosing her personal relationship with each member of its developer, Fullbright — Steve Gaynor, Karla Zimonja, Kate Craig and Johnnemann Nordhagen — as well as voice actress Sarah Elmaleh and composer Chris Remo, (also a former coworker of Alexander). Wrote twice about BabyCastles without disclosing her friendship with several people involved in the gaming venue. Wrote about Mitu Khandaker-Kokoris without disclosing their admitted personal relationship. Wrote about Zoe Quinn without disclosing their personal relatioship. Wrote two times — plus one namedrop — about Mattie Brice, without disclosing an apparently fairly intimate friendship, involving fairly regular friendly meetups. Wrote about fellow journalist Jenn Frank, as part of a Critical Distance lineup, without disclosing that Frank was financially supporting both her and Critical Distance on Patreon. Wrote two times about Cara Ellison, without disclosing he was financially supporting her on Patreon. Wrote about Mattie Brice without disclosing he was financially supporting her on Patreon. Gave coverage to Kent Sheely without disclosing he was being supported by him on Patreon. Gave coverage to Javy Gwaltney two times, without disclosing he was being supported by him on Patreon. An article written by Gamasutra “Staff” props Tale of Tales as one of the top-10 developers of 2015, without disclosing the involvement of former Gamasutra Editor Leigh Alexander, who was involved with Sunset, the final game of the defunct studio, through her consulting company Agency for Games. Gaming news website belonging to UBM — making it the online companion to now-defunct print magazine Game Developer, as well as home outlet for UBM undertakings such as the Game Developer Conference (GDC) and Indie Game Festival (IGF). Doesn't offer reviews, instead having a focus on game development, with a section detailing job offers in the game industry. Kickstarted the "Gamers are Dead" articles with then-Editor Leigh Alexander's infamous piece, being the only outlet to offer a second article.